Seventeen Doll'd Up 3-way liquid eyeliner looks intimidating at first glance. At least to me. I do not wear make up on a regular basis and eyeliner feels somewhat alien to me (I still manage to be goth sans dark and smokey eyeliner ;P). The lovely Lina-Elvira gifted me this wonderful eyeliner a while back and I really really like it! It's easy to apply for a noob like me and it stays on and does not smear at all. Unlike regular eyeliner, this one stays pitch black all day long and does not fade one bit. But once you do want it to come off, it's not hard to wash off with a good eye make up remover. I fancied something really bling tonight, and was inspired by a link my Mum sent me the other day with a reverse glitter gradient. Today was the first time I have had issues with applying this OPI Matte colour. It separated in some places to make it look a bit like a shatter polish? Anyone else had this issue? Or is it a reaction to my Bourjois gel effect base coat?.. I used Claires "Chunky Silver" and Isadora "Sparkling Ice" to layer up the glitter gradient. This manicure is in fact so bling it refuses to photograph so I did a little video instead to show off the glitteriness. I will try and get a daylight shot tomorrow! 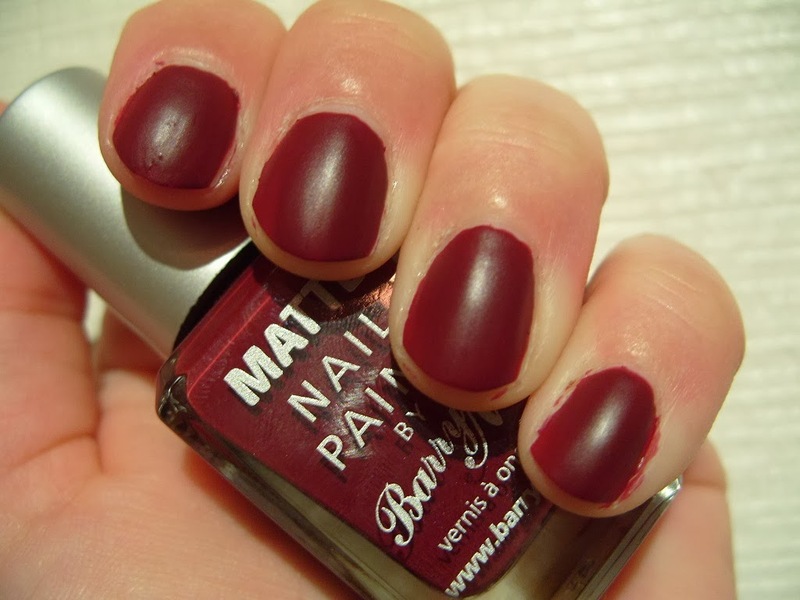 NOTD: Barry M Matte "Crush"
I struggled a bit with the formula on this one, it's a strange combo of thickly pigmented polish and runny mess :O I also dragged a bit on my index finger and messed up the layer underneath so it's really obvious in the photo. A steady hand and just the right amount of polish on the brush is essential for a smooth application. I am also finding it dries quite slowly to a dent-proof finish so expect to sit around watching TV for a while (I was watching 'Supergiant Animals' with Steve Backshall so I was good to wait for an hour!). 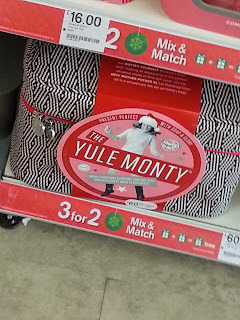 'The Yule Monty' is £60 but I've not seen what's supposedly in it this year. I decided I wanted to do something green but was keen to try the RockIt's Jewels set. 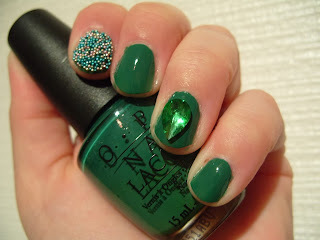 So I did OPI "Jade Is The New Black" and put on some MUA Nail Constellation in "Pisces" and a green jewel :) I love it, but the jewel kept falling off and I couldn't find any nail glue. 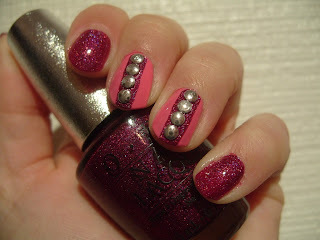 So I picked the jewel off and put some Nail Constellation there instead! I did 2 coats of the OPI. 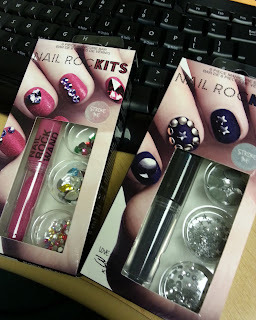 I think if I am to try the nail jewel again I am going to have to find that nail glue! 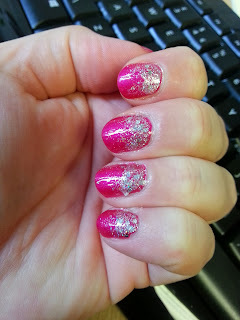 NOTD: Nail Rockits Studs and OPI DS "Extravagance"
I had all these ideas in the afternoon of what I would do and ended up with this design after a bit of messing around (including getting pink flocking powder on the cat)... I will definitely try the flocking powder with the next set, the crystals. I am sooooo into these studs - they just pop! And they don't discolour or dull when you seal them with top coat like some cheaper versions do. This is 2 coats of OPI Designer Series "Extravagance" (purple) with 2 coats of Rimmel LycraPRO "Urban Princess" (pink) and a stripe of 2 coats of "Extravagance" to set the studs on. 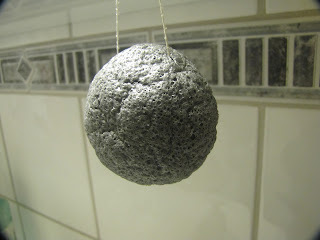 I have been using the Konjac Sponge with bamboo charcoal (the black sponge) daily for a month now. I really like it! 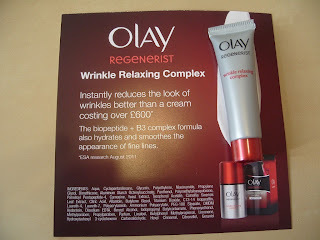 It has helped me keep my breakouts to a minimum and it has also cleaned out the pores on my nose. Yay!  I have combination skin and the sponge leaves my skin feeling fresh and smooth, but I am not sure if it would have the same effect if you have very oily skin. The sponge is perfect for a quick and fresh morning wash. It's great for the evening wash too, but not if you are wearing make up. 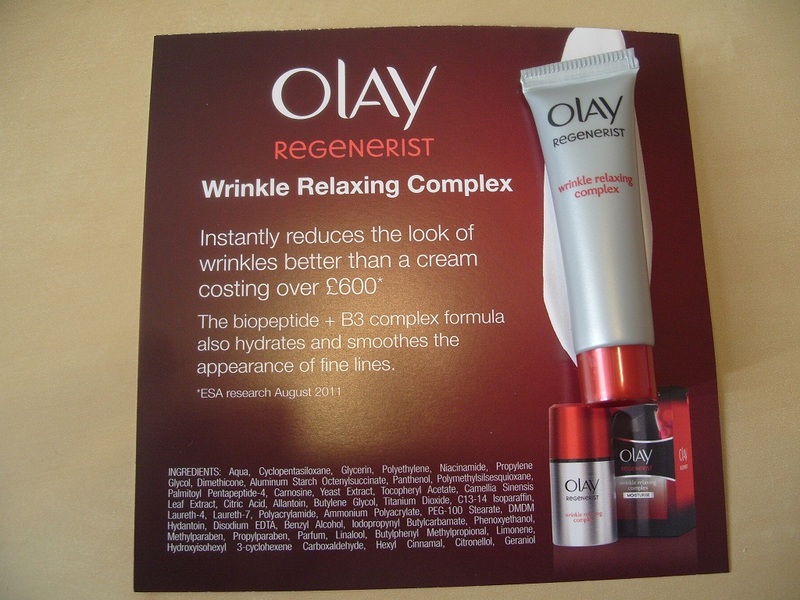 It is not very good at removing make up, so I would recommend using a make up remover or regular cleanser for that. One perk of using the sponge is that you do not need to towel dry after using it. It doesn't leave your face dripping with water, so you can let it air dry within minutes. I have become an avid sponge user! 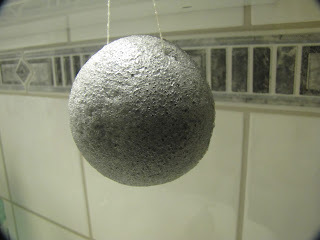 I attached a couple of photos of what the sponge looks like after 1 month of use - pretty much the same as when I got it. I've been a bit crap on updating but I've been really busy.. I had a day off today so I decided to clear out my wardrobe... Big mistake. Felt like it took all damn day! Too much work for a day off. 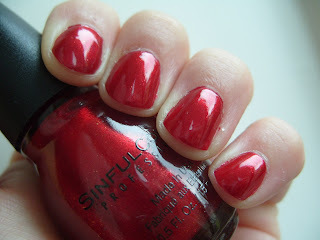 First this week I wore Sinful Colors "Sugar Sugar", a sparkly red with almost flecks of gold?.. I loved it :) It' stayed on all week! This is 2 coats with Megashine. I had a bit of wonky brush on this, so it was quite messy. I am struggling with lighting just now for my photos, so this is actually the day after application in indirect sunlight. 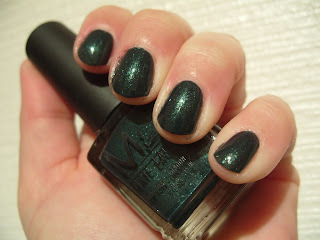 Tonight I was deciding between two polishes but decided finally on this old classic - Misa "Toxic Seduction". This is 2 coats and Megashine. I hate how this never looks right in photos :( I will try get better photos tomorrow. It just looks murky, and doesn't show the green glow it has in real life. Please excuse the horrendous state of my cuticles, my hands are mega-dry just now for some reason.